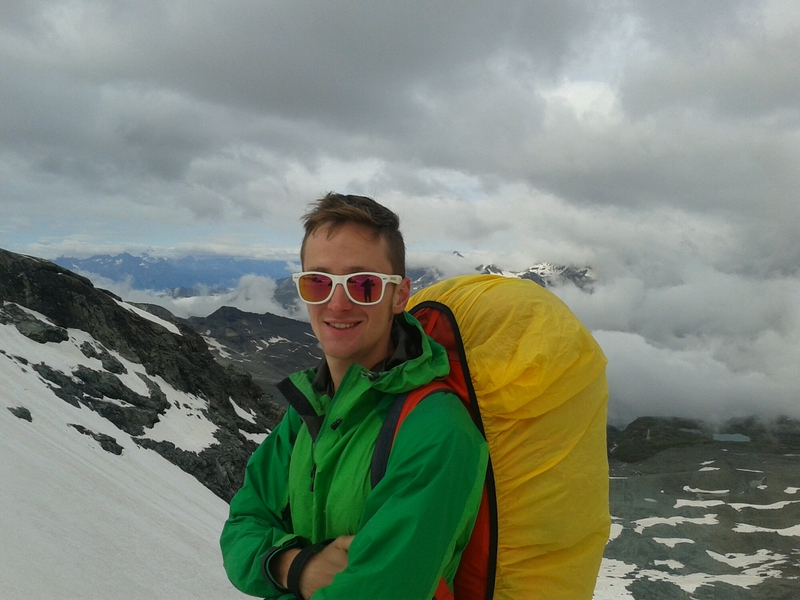 So, finally today I crossed the main spine of the Alps again, reaching the highest point, at least so far, of my trek. The weather in the morning was rather better than expected; it seems the storm advised for Saturday had already passed through on Friday night. 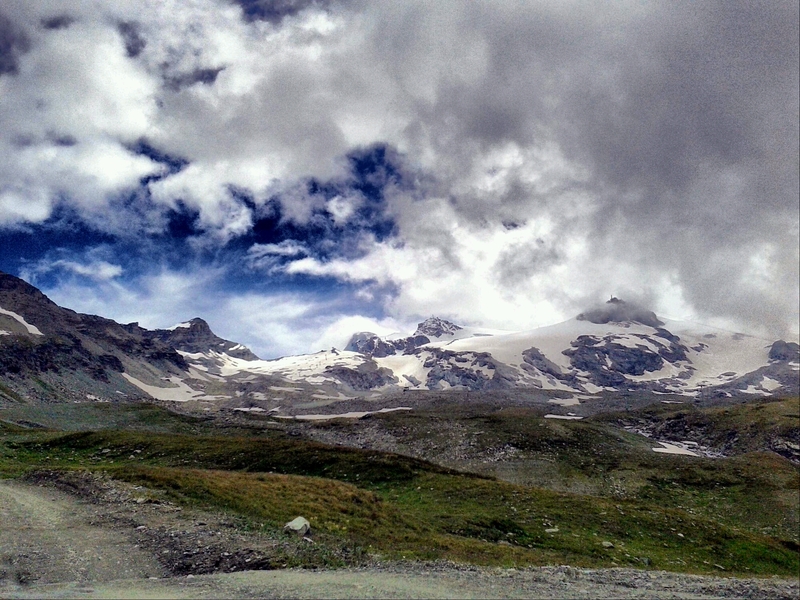 So with some visibility, and together with two human (and one canine) companions who were headed in the same direction, in the morning I crossed the Theodulgletscher up to the Theoduljoch (3301m) and the border of Italy with Switzerland, just a few km east of the Matterhorn, which I still haven’t seen. It’s interesting to note that in the Middle Ages, when the Valser people settled this valley, the pass was ice-free and part of an important trade route. 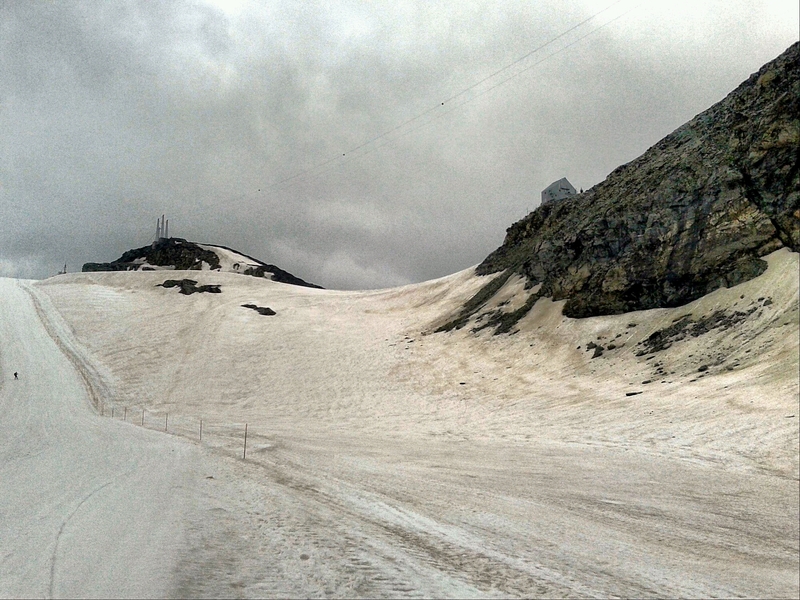 But then the “little ice age” came, and a glacier (which is now part of the Zermatt ski area) has covered the area to the North of the pass ever since. Perhaps this indicates there is hope that the current climate-change induced glacier-melt is just temporary and not irreversible. At the top; Italy in the background. Thanks Thomas for taking the picture. At the Rifugio Theodul, just a few metres above the pass, and at 3317m the highest point of the trek so far (possibly the highest, period), my companions and I had coffee together and then went our separate ways. My way was not too far, just down through the Italian ski area to Breuil-Cervinia, the Italian counterweight to Zermatt – a short day of trekking motivated, in part, by the desire to rest my troubled knee, and in part simply to peacefully enjoy Italian food and hospitality. 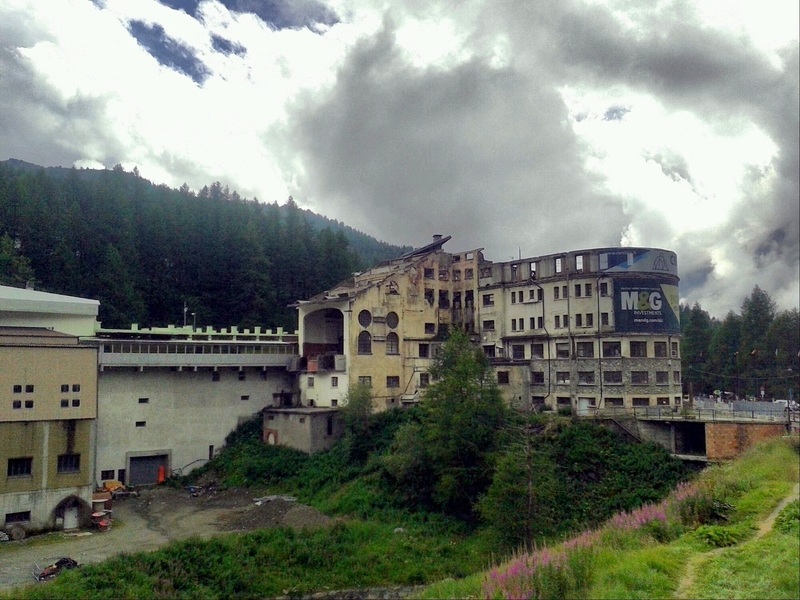 Sadly the day also contained a taste of the apparently very Italian desire to build ugly buildings in the Alps and then, when they are disused, just leave them there. 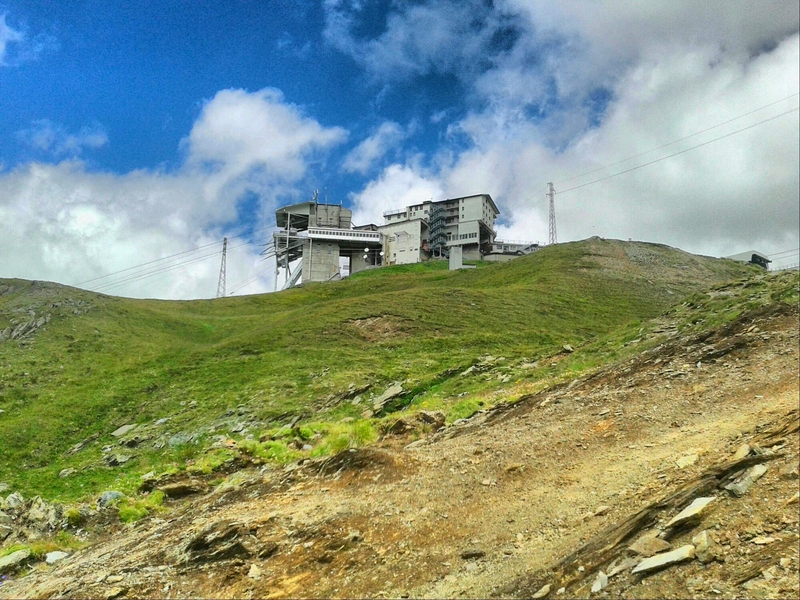 …and then in town: the worst building I have ever seen in the Alps. And I have been to France! Before beginning this trek, I wondered a lot about what to carry: what does one bring on a trek of (perhaps) 1500km through all the climate zones of Europe? And for up to three months? I’ve been asked questions about the equipment by many people I met; and I suspect some of you readers may be curious too. With the benefit of now seven weeks of endurance-testing it, I figure that reviewing* my equipment may be useful to some fellow (or prospective) trekkers. I will do so here occasionally, beginning with the basics. To begin with the basics: the rucksack. When I was planning the trip I had the ambitious goal of carrying only 8kg; I found that with a tent, sleeping bag and sleeping pad this was impossible. Including 1 litre of water and some food, I’m carrying approximately 10kg, which is still comparatively light. 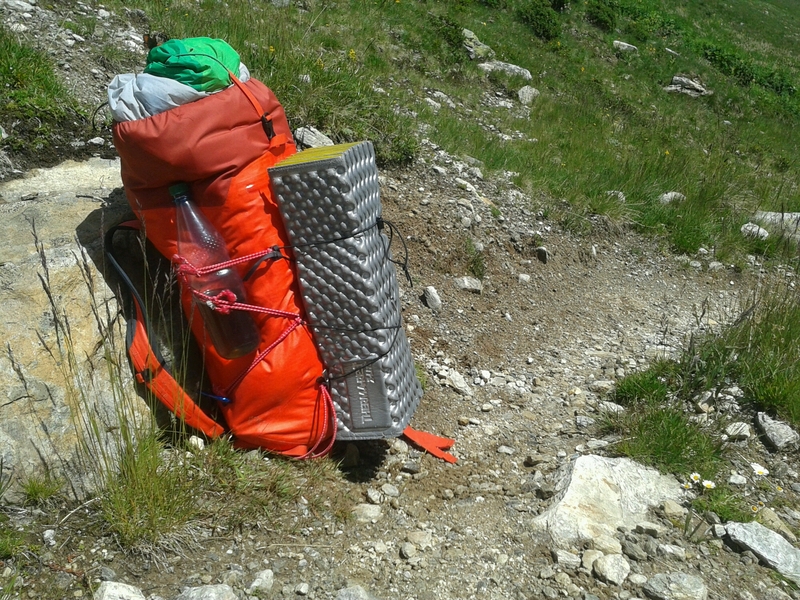 In part this low weight is thanks to the rucksack itself: the very light Arcteryx Alpha FL 45. FL stands for featherlight, apparently. 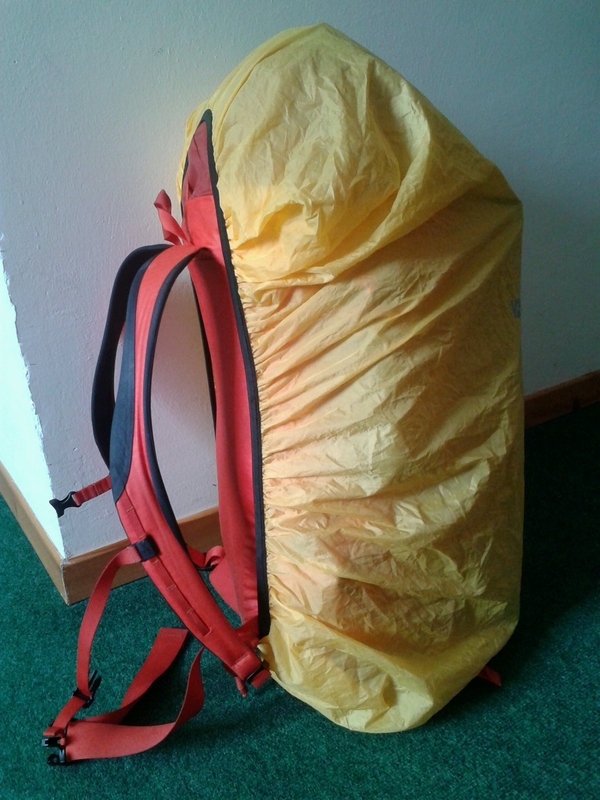 When empty, it weighs only 600 grams; compare that to other trekking rucksacks of similar volumEd, which often weigh 1.5 to 2 kg, just the rucksack itself. Of course that means that this bag is spartan. It lacks any padding, which is okay because I’m not carrying a heavy overall load. It lacks a back “ventilation system”, but that’s okay because I’ve found such systems hardly make a difference in practice when one’s sweating. And it lacks an accessible smaller pouch (for valuables, sun cream, etc. ), which is mildly annoying. 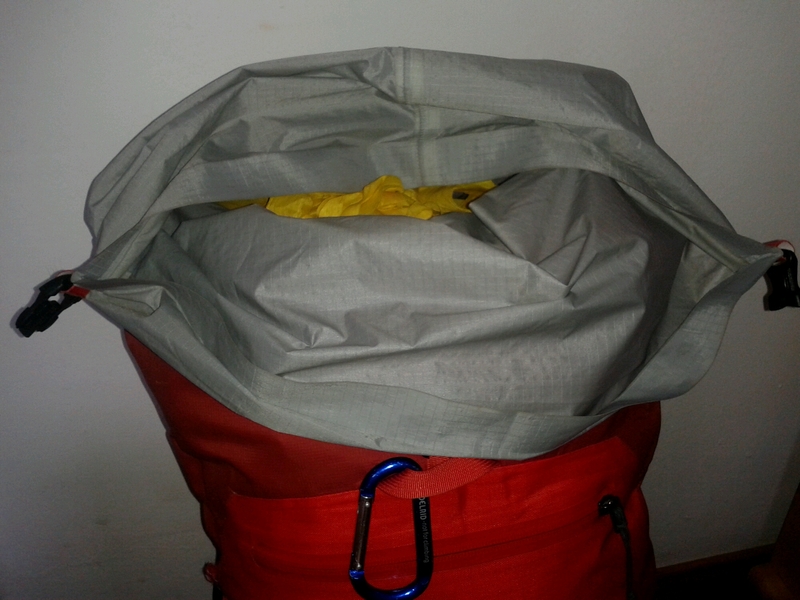 For attaching things to the outside it has only one elastic string, no mesh; but there are a number of extra attachment points, which I’ve outfitted with extra elastic from a hardware store, to attach things like clothing, the tent, a water bottle. 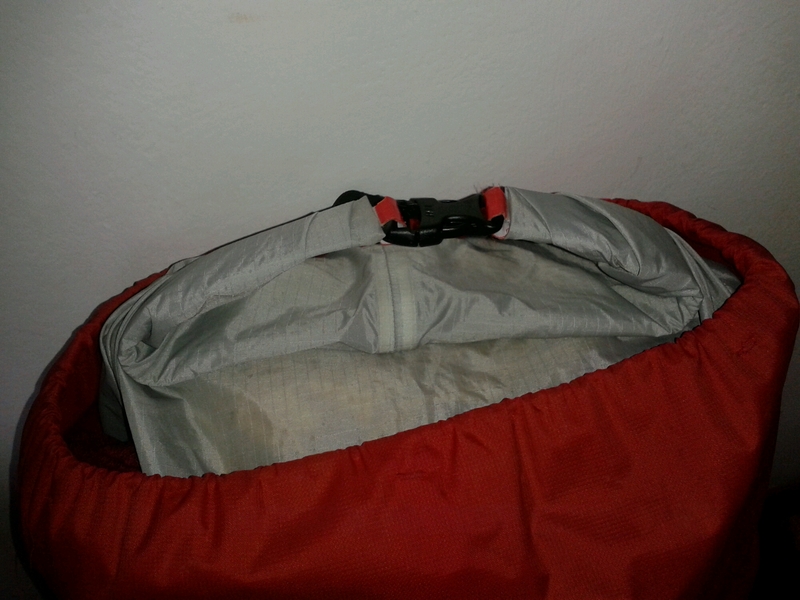 The top is closed by rolling up the fabric like those bicycle or canoeing bags; it’s waterproof. Overall I’m very happy with my choice of this bag. The drawbacks are acceptable compared to the vast weight advantage. I am not suffering from a sore back or shoulders. The material seems to be extremely durable; no significant wear and tear, even after seven weeks.